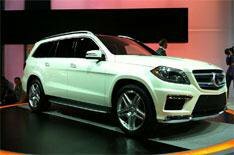 New York 2012: Mercedes GL unveiled | What Car? The 2012 Mercedes-Benz GL has been unveiled at the 2012 New York motor show. The updated SUV has a new look inside and out, more high-tech kit and cleaner engines. The new Mercedes GL has a fresh design that has clear references to the current GL, but is also strongly influenced by the closely related 2012 M-Class. It includes LED details for the headlights, and a front bumper that features LED running lights and extended chrome-effect trim. A new AMG Exterior Sports Package option gives the GL a sportier look, with deeper front and rear bumpers, flared wheelarches, 21-inch alloys and aluminium-look running boards. Inside, the 2012 Mercedes GL has a new interior, with improved packaging that gives more shoulder space and headroom. As before, there are seven seats, the rear pair of which fold up or down electrically as required. A new Easy-Entry system that electrically moves the outer middle row seats to provide access to the rear row is an option. The petrol and diesel versions have more power than their predecessors, but fuel economy has improved by an average 19%. Low-rolling-resistance tyres, a new electric power-steering system and a stop-start system are fitted to all versions, while additional lightweight construction techniques give a weight reduction of nearly 100kg. GL350 Bluetec diesel models have power boosted by 56bhp to 254bhp, while torque rises 59lb ft to 457lb ft; CO2 emissions drop to a minimum of 192g/km and average fuel economy is 38.0mpg. The GL500 Blue Efficiency V8 petrol model now has 402bhp; average fuel economy is 25.0mpg and CO2 emissions of 262g/km. A range of new safety kit comes as standard. Mercedes Collision Prevention Assist warns the driver if sensors detect an imminent collision, while Attention Assist monitors the drivers behaviour and alerts them if they start to appear drowsy. Steer Control applies force through the steering wheel to correct a slide, while Crosswind Assist is a new innovation that uses small braking inputs to counteract the effect of high side winds at speed. Lane Keeping Assist, Active Blind Spot Assist, Night View Assist and Speed Limit Assist are also available, and theres a new parking option that can automatically steer the car into a space. Adaptive Highbeam Assist and Night View Assist are aimed at improving visibility at night, while a new parking camera system similar to that used on some BMW and Nissan models projects a birds-eye view of the car onto the central display to aid entry into tight spaces. Prices and full specifications are yet to be announced, but wed expect a small increase over the current model, which starts at 58,935. The new Mercedes GL goes on sale in the UK in early 2013.